Roundabouts have steadily emerged across our nation in recent years and have even become the new norm for many of our communities. The numerous benefits of roundabouts, including continuous traffic flow and decreased severity in crashes, are undeniable. However, there are also some poorly designed examples that showcase why it is crucial to design and construct roundabouts in an exceedingly prudent manner. This holds true, not only for vehicular considerations, but also for pedestrian safety. 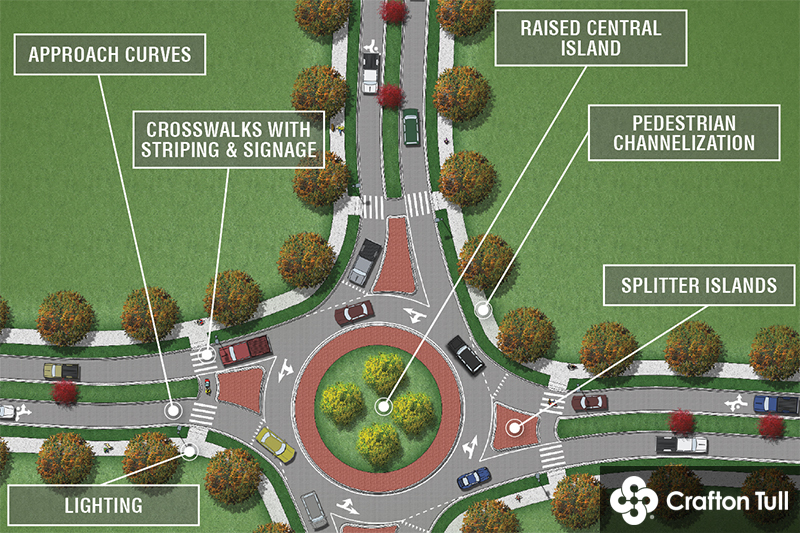 There are some misconceptions that roundabouts pose a greater danger to pedestrians than traditional intersections with traffic signal or stop sign control. Roundabouts are a proven way to increase safety and efficiency for all those sharing the road – including pedestrians. 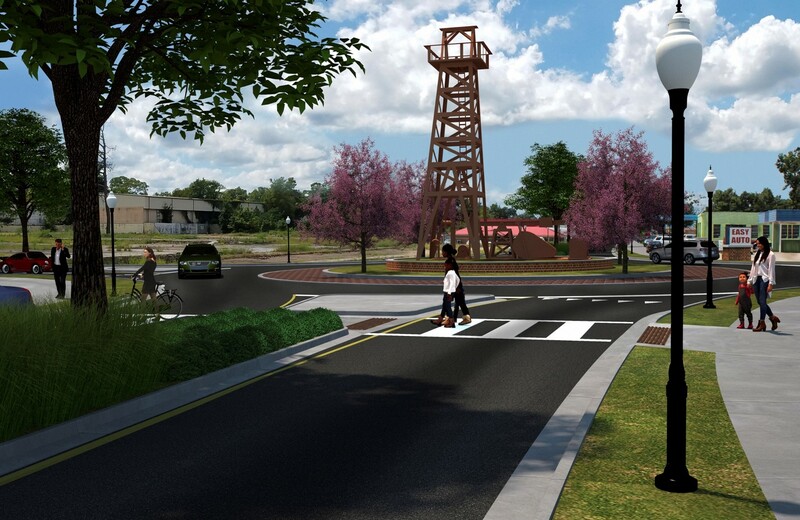 Federal Highway Administration and Insurance Institute for Highway Safety studies have shown that properly designed roundabouts result in as much as a 40 percent reduction in pedestrian collisions along with other significant improvements in safety over more traditional intersections. Design the roundabout approach curves to progressively reduce vehicular speeds prior to entry. Slower speeds at or below 20 mph are much safer and enable pedestrians to find gaps in traffic to safely cross and encourage vehicles to yield to them as they step up to the crosswalk. Place earth fill and architectural features in the central island to make it visible to approaching drivers. A raised central island prevents drivers from seeing all the way through to the other side of the roundabout and encourages them to slow down to negotiate the turns. This places the driver’s focus and attention back to the near side crosswalk rather than looking further ahead through the roundabout. Provide refuge for pedestrians within the splitter islands of sufficient width to accommodate the length of bicycles. The refuge island allows pedestrian and bicycle users to look left first at oncoming traffic, then look right after reaching the island. Negotiating traffic one direction at a time reduces the user stress levels, which can lead to a safer outcome. Raised splitter islands with low landscaping or architectural features can encourage reduced vehicle speeds and make pedestrians feel safer while in the island as long as the low elements don’t block visibility. Install roadway luminaires in the appropriate locations on the approach side of each crosswalk. This ensures that pedestrians are illuminated from the approaching driver’s point of view. Lights installed on the opposite side of the crosswalk will illuminate the wrong side of pedestrians, causing them appear as shadows from the approaching driver’s view. Follow FHWA guidelines on placement of crosswalks to allow for one car length or approximately 25 feet from the edge of the circulatory roadway. Vehicle speeds are relatively slow in these locations. Consider raised “speed table” type crosswalks that offer more visibility along with slower speeds that can encourage vehicles to yield to the pedestrians. Speed tables also reduce the need for ADA curb cuts allowing wheelchairs and bicycles to continue through the crossing at sidewalk level. Consider adding pedestrian channelization features such as railings, bollard-and-chain barriers, landscaping, planters, or other architectural elements. Such features will guide pedestrians to the appropriate crosswalk locations where scattered or random crossing movements become problematic. Place crosswalk striping and accompanying signs in such a manner as to maximize their visibility to drivers. Consider high-contrast colored and patterned pavement treatments to provide additional visibility for the crosswalks. Advanced warning signs should also be placed to alert drivers they are approaching a roundabout and encourage speed reduction. Striping and signage are absolutely critical to the function of roundabouts and should be refreshed on a regular basis. Consider additional signage and signals in areas of heavier pedestrian movements. Such treatments could range from simple flashing beacons, to pedestrian activated devices such as LED edge lit signs, Rectangular Rapid Flash Beacons, or embedded pavement lights, to full-fledged pedestrian hybrid beacons or “HAWK” signals. If possible, extremely heavy pedestrian volumes should be re-routed away from a roundabout via a tunnel or bridge. It is no secret to those in the industry that roundabouts can be a hot-button issue. One way to allay community concerns is to keep residents in the loop through public outreach via the city’s website, social media, and press releases. The FHWA compiled a Roundabouts Outreach & Education Toolbox to help cities and towns gain support for roundabouts, including animated videos. Cities across the U.S. are seeing the benefits of implementing roundabouts into their transportation networks. As municipal engineers manage the design and construction of these types of transportation nodes, ample consideration should also be given to pedestrian safety using the guidelines above.